UPDATE: Palm Beach Gardens police have located the ATV’s. Thanks to the hard work of the Palm Beach Gardens Police Department and a neighbor with a good eye who had seen our posts, our ATVs have been recovered by PBG PD! There had been an unsuccessful attempt to hot-wire the ATVs but other than that, there is no major damage. The ATVs were still locked together so these people had gone through some effort to get them off of our property, roll them through the neighborhood tied together and not running, and stashed them behind a church in the neighborhood before giving up to likely return tonight. The day was saved thanks to all of your shares! We thank you from the bottom of our hearts and we are beyond ecstatic! 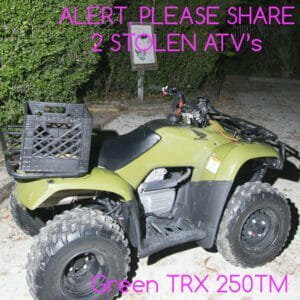 Two of our ATVs were stolen last night in Palm Beach Gardens. These ATVs are the most important piece of equipment we utilize and have been purchased with your donation money and hard earned grants. We are a small nonprofit managed by two people and all of our efforts are volunteer-based. We do not take any salaries and all of the funds that we raise are used to purchase equipment to research leatherback turtles. We are devastated and can’t believe this has happened.